When we last saw Thomas and Li-Ming… the parchment rematerialized and was invisible because it sensed that Lady Hallow was near. Gillette leaves to keep the parchment safe as Thomas, Li-Ming, and Norm ran to use Gillette’s spell book to get back home, but instead the spell brought them into the future! Thomas and Li-Ming grabbed one another. “Did you hear that? !” they said in unison. Norm stood with his mouth ajar. “Let’s try another spell,” Li-Ming said. They hurried up the wooden staircase to the third floor. Another robot was coming down the long corridor from the art gallery. They stepped into the library filled with books and glass display cases showcasing various artifacts from Gillette’s life. Norm unfolded the worn pages containing the spells. Thomas held the wand over them. “Which one should we try?” he said. She was staring into one of the glass display cases with her back to them. “What is it?” Thomas said. “You need to come here,” she said. “But the case is locked,” Li-Ming said. “Fast,” Norm said, holding the parchment. They huddled closely while Thomas held the wand and read another spell. The castle shook, spinning faster and faster. Then everything was still. They looked at one another in silence. The robot was gone. “Do you think it worked?” Thomas said, gripping the blue feather. “Come on,” Norm said. They took the stairs to the roof. Outside, the sky was red from the late afternoon sun. They were still on Gillette’s land. Through the colorful autumn leaves, a yellow school bus was parked far below. They could see what appeared to be Mr. Espinoza and their classmates on a pathway. “Look! We’re back in our time! We did it!” Thomas and Li-Ming shouted. “And the future will be changed,” Li-Ming gasped. “We’ll at least go explain things,” Norm said, guiding them downstairs. 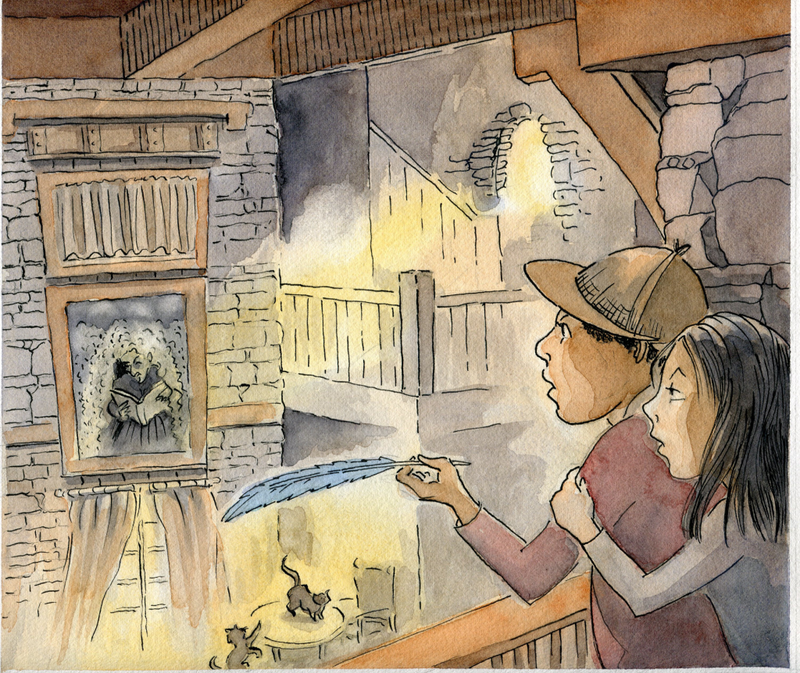 From the second-floor balcony, they saw two black cats pawing at the wooden coffee table below. “Shh,” Thomas crouched, pulling Li-Ming with him. He pointed to a mirror above the French doors beside the fireplace. In its reflection, standing at the liquor cabinet across the Great Room, they saw a small, hunched figure draped in a long cloak with wiry hair to her feet. She was the most hideous and ancient-looking creature they’d ever seen. She was turning pages of a large book, billows of dust rising, muttering something about Lockwood-Mathews Mansion. “Lady Hallow!” Li-Ming cried into her hands. What is so important about the Magic Feather and how did Norm, Thomas, and Li-Ming get it? How did Norm, Thomas, and Li-Ming escape the blaring alarms after breaking into the locked case? How is Lady Hollow described at the end of Chapter 9? What details support her evil characteristics?